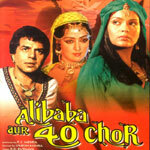 "Alibaba Aur 40 Chor" is a 1980 hindi film which has Dharmendra, Hema Malini, Zeenat Aman, Prem Chopra, Frunze Marktchin, Madan Puri, Pinchoo Kapoor and Mac Mohan in lead roles. We have 4 songs lyrics and 4 video songs of Alibaba Aur 40 Chor. R. D. Burman has composed its music. Lata Mangeshkar, Asha Bhosle and Kishore Kumar have sung these songs while Anand Bakshi has penned its lyrics.